Project Name: Global Studio - "Re-drawing Jovi"
Vision: To reconceptualize a model of urban transformation that meets the basic needs of the local residents through encouraging investment and development that builds on existing social and physical infrastructures. On our first visit to the site, standing atop the Carlton Center peering down into the area, revealed a seemingly desolate landscape of abandoned buildings, vacant lots, and streets largely devoid of people. In contrast, exploring the neighborhood by foot revealed layers that did not appear on city maps or the architects initial plans for redevelopment. 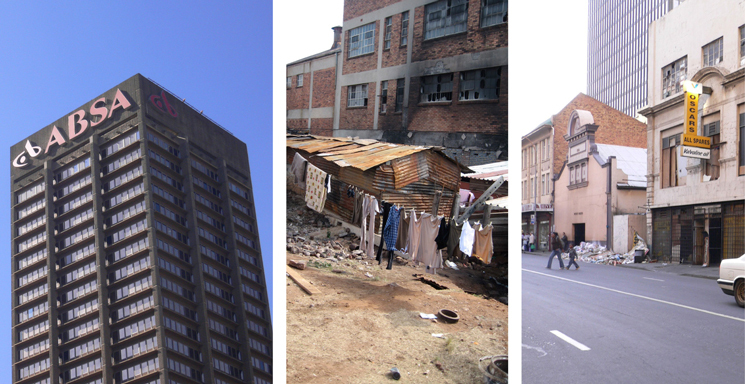 We began to understand the role that this ‚Äòdead‚Äô zone of the CBD plays in the wider Johannesburg area: as car repair district, transitional space for recent migrants and immigrants, home to long-term residents, and a labor force for the greater CBD. Our initial investigations on the ground revealed that far from being an abandoned warehouse district, the area was in fact home to a bustling auto repair industry with a state of the art training facility, and thousands of mostly hidden residents who had transformed warehouse and open space alike into high density housing of various levels of formality. 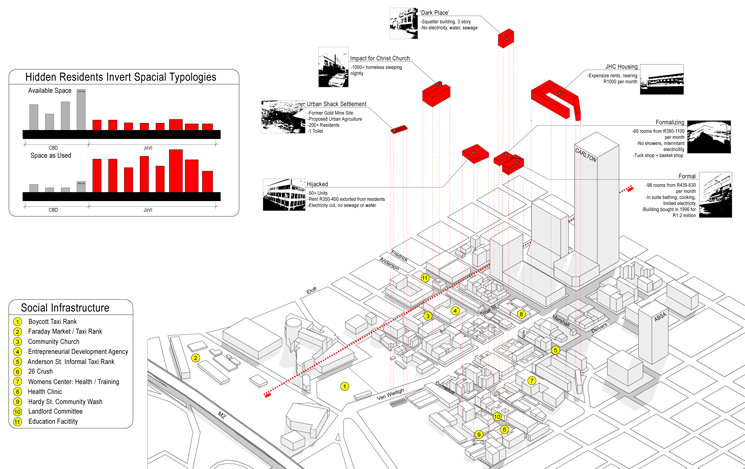 Motsepe Architect's plan is a response to the Johannesburg City's intentions of development in the inner city region. 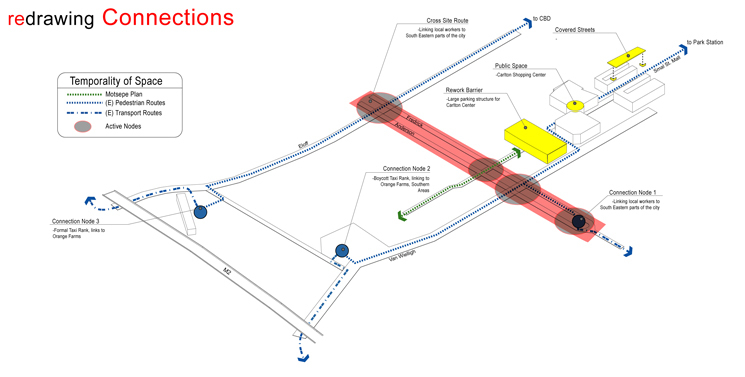 Such development strategies are underscored in the Jozi city map. 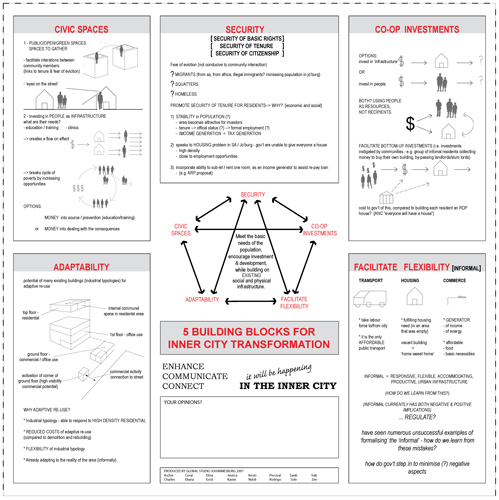 We re-wrote the Jozi -Johannesburg's city map, which currently highlights the pillar inner city regeneration strategy, and generated our own building blocks for inner city transformation. 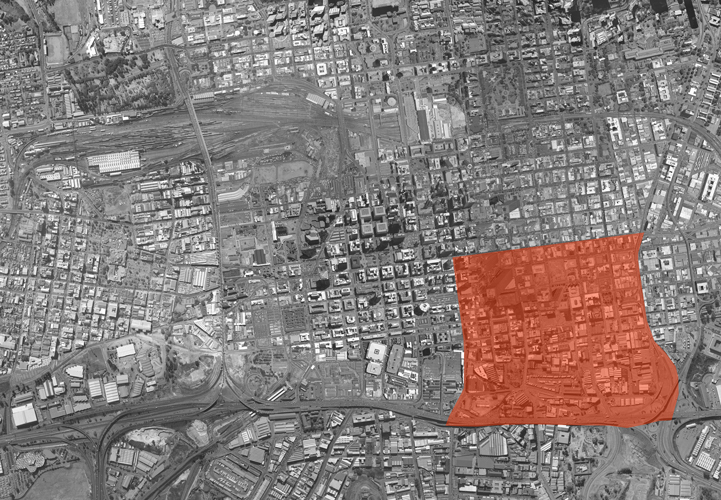 While the city plan aimed to redevelop the inner city through investment in increasing real-estate values and its accompanying ripple effects, our approach aims to enhance the existing strengths of the area by revealing its rich social and spatial conditions, and by connecting the areas hidden populations to the larger city. One of the primary elements that needs re-examination are notions of the formal and informal, in both residential and economic conditions. While the city attaches mostly negative interpretations to the category of ‚Äòinformal‚Äô our concept allows for celebrating the informal as a responsive, flexible, accommodating, productive, and high-density urban response.